At Castle Kitchens we carry a huge selection of Kitchen Countertops in Quartz, Marble, and Granite with various Edge Profiles and colours. In our showroom we display all brand name Quartz manufacturers as well as natural stone samples. With the durability of Quartz, we are finding it is making its way into more to kitchens, bathrooms and laundry rooms. Quartzite, the natural stone is one of the hardest and most common minerals on Earth. 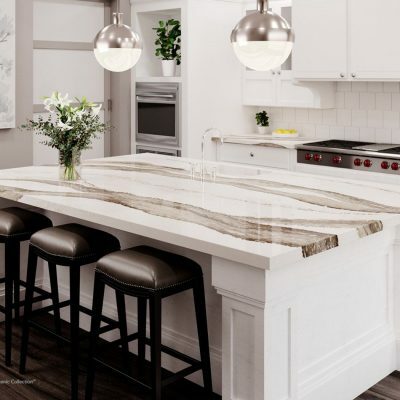 Quartz is a combination of the natural stone along with synthetic materials allowing the material to be more durable and less porous and ultimately maintenance free. Quartz consists of on average 93% mineral content as compared to solid surface which is 66%, and polymer 33%. You can get the natural look of stone, but with superior performance. Let the experts at Castle Kitchens help you in choosing the right Kitchen Countertop. Quartz brands we carry include Cambria, Caesarstone, Hanstone and Silestone. Composition: Around 93% mineral content. In contrast, solid surface 66% mineral and 33% in polymer. Low Water Absorption Rate: Quartz’ low water absorption rate of 0.5% is on par with another low porosity material–porcelain tile. If the material weighs less than half of 1% more as a result of water absorbing into its surface, it is considered to be nonabsorbent. Visible Seams: Unless the countertop is small enough to be fabricated from a single slab, two slabs often need to be seamed together. Depending on the skill of the installer, this seam can be minimized but it will never be invisible. We are conveniently located in Markham, Ontario and serve the communities of Toronto, Scarborough, Richmond Hill, Thornhill, Stouffville, Mississauga, Ajax, Pickering, Whitby and surrounding areas. And so, if you are in the market for a quality Kitchen Countertop, drop by our huge showroom.